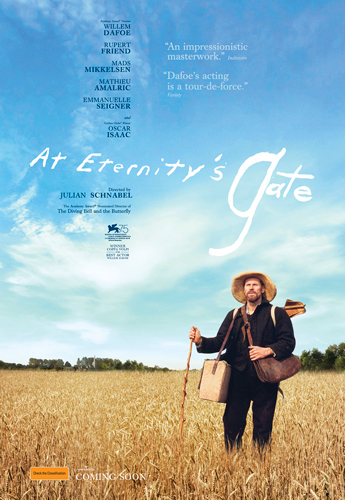 Julian Schnabel’s 'At Eternity’s Gate' is a journey inside the world and mind of a person who, despite skepticism, ridicule and illness, created some of the world’s most beloved and stunning works of art. This is not a forensic biography, but rather scenes based on Vincent van Gogh’s (Academy Award Nominee Willem Dafoe) letters, common agreement about events in his life that present as facts, hearsay, and moments that are just plain invented. Click here to read our four-star review of ‘At Eternity's Gate’. The 'At Eternity's Gate' competition has now closed. Winners will be announced shortly. Competition opens at 5pm AEDT on Sunday 3rd February 2019 and closes at 11:59pm AEDT on Sunday 10th February 2019. Five winners will be chosen at random on Monday 11th February 2019. To successfully win, entrants must fulfil the above entry conditions before the time the competition closes. Current members/followers are eligible to enter the competition. Only one entry per person. Only one winner per household. To be a valid winner, the entrant must not have won a prize from SWITCH within the last 28 days. Each winner will receive one double pass to 'At Eternity's Gate'. By entering, you agree to receive occasional emails from SWITCH in the future. If you decide to unsubscribe from these updates, any further entries will not be applicable. Only Australian residents are eligible to enter. 'At Eternity's Gate' is in cinemas from Thursday the 14th February 2019 through Transmission.